This 11-year-old has her own real-life Narnia. Interior designer Laura Medicus decided to give her daughter, Sylvia, a secret room that would make any preteen jealous. 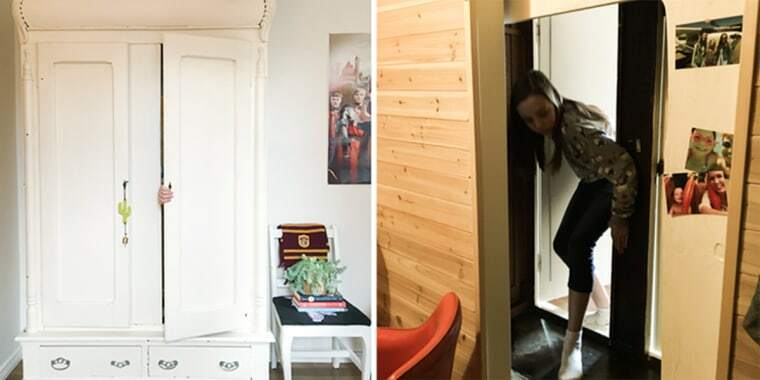 Sylvia’s room in their Denver home didn’t have a built-in closet, so she used a vintage armoire they'd found on Craigslist for years. But (as any parent knows) as kids get older, they accumulate more stuff and Sylvia was outgrowing the furniture. Medicus figured out a solution: She would give Sylvia the master bedroom closet, since it already shared a wall with her room. But the supermom didn’t stop there. “I have always been intrigued by secret doors and rooms and had the idea of putting her wardrobe in front of the opening,” Medicus told TODAY Home. Three weekends of work and $500 in supplies later, the result is a cool passageway that leads to a lounge and closet space for Sylvia. “It was much easier than I thought it would be,” Medicus said about the project. After closing up the closet in their room, she and her husband added an opening from their daughter’s side. Then they took off the back of the armoire and lined it up against the opening before anchoring it to the wall. The closet was transformed into a lounge for Sylvia to hang out in with cozy chairs, a crate table, a lamp and plenty of books. To get the cabin feel that Sylvia requested, they lined the walls with cedar planks. And, of course, gave her a space dedicated to clothes and accessories. Her friends are also big fans of the space. “They say that they want one, too, and, ‘Oh, it's just like 'The Lion, the Witch and the Wardrobe!’” she added. Medicus, who documented the whole project on her blog The Colorado Nest, said her favorite part of the whole thing is seeing the delight it gives her daughter on a daily basis.